Today, I am going to introduce you all to a gaming app thats both fun to play and needs brains! Yup, I recently came across this app, Situation SHUFFLE, in the iTunes store while strolling around as usual and to be honest the puzzles in this game will make you scratch your heads but won’t bore you. The Situation SHUFFLE app comes with a big collection of mind-challenging puzzles that focus on reasoning and strategy representing real life situations. To pass these puzzles, you need a keen sense of problem solving skills and a little bit of attention to detail which makes sure your brain gets a complete workout. To start with, the puzzles seem like child’s play, but they need your complete attention and concentration to crack them. The app has 30 IQ puzzles, 30 extra quizzes and 6 hidden SHUFFLE quizzes. As and when you complete an IQ puzzle you can take up the corresponding extra quiz. Each IQ puzzle consists of 6 slides representing common events and occurrences like a trip to an amusement park, a busy day at work, a birthday celebration, a scene in an elevator etc. The slides have to be arranged in the right sequence and have striking graphics and you get 4 hints for each puzzle. You can zoom into the slides to compare them and make a mental note of minute details. The details may be really subtle at times, but that could make all the difference. 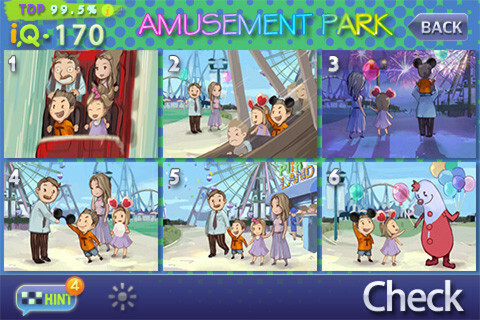 Once you have arranged the slides in order, you can submit your puzzle by pressing on the Check option. Your scores are calculated based on factors such as the number of hints you’ve used, the number of times you check whether your answer is right etc. The extra bonus puzzles that come with the app are also of the same type but are a tidbit easier to solve. The 30 SHUFFLE puzzles get unlocked based on conditions like, the number of IQ & extra puzzles you’ve cleared and your score. These puzzles are quite challenging and your IQ points are determined by the number of combos you score. The UI of the app is pretty cool and the graphics are pleasant. Moreover, the app is simple to use and you can get started immediately playing the puzzles. But it would have been good if the tutorial had a better video like demonstration for users to easily grasp how the app works. Though there is one present, its just too slow and lacks details. Also, there is no information as to if additional puzzles will be added. I was hooked on to this game for about a full day and managed to complete almost 75 percent of the puzzles. I think its just wait and see. But if new puzzles are added for additional cots or even if the developers could offer in-app purchases, I will be buying them for sure. Go try this app and share your feedback in the comments below. The Situation SHUFFLE app is available in the iTunes store for 99 cents. Wow!! Really interesting app, I like to play puzzle games and enjoy watching spy movies. I think this game app is definitely for me. This is exactly what I like – puzzles as they make my brain work. Thanks for the pleasant and even striking news. I am going to surf the store and get it as soon as I can or may be even try to find the similar game online. This seems like a great game. These types of games, where your IQ gets challenged, are the games that are hard to let go of. Nice review! Thanks! Thanks for the tip RonF. It’s not easy finding things in the Apple App Store these days as there’s so much to choose from. Would you have any suggestions for similar iPad puzzle apps? There are plenty to choose from like you said… for more puzzle games, I suggest you take a look at the puzzle games section in iTunes, thats where I found this one.. I also like to troll around at app strore when I’m bored but it could be expensive lol. I’m personally not into puzzle games because they are too heavy for my brain lol.. But my son is into that kind of games, so I would like to try this app. I’ll update if he likes this app. Thanks for the comment, welcome to Technology Bloggers!